The 2017 Walk to End Alzheimer’s – St. Cloud, MN is quickly approaching and we are excited to participate in the event again this year! This local event provides us a way to do something we are so passionate about, to advance Alzheimer’s support, care, and research! 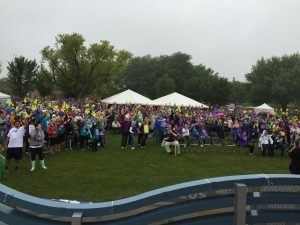 Katrice Sisson, Community Engagement Manager for the Alzheimer’s Association and Sue Christensen, our president of Arise, help answer some of the most frequently asked questions about the event. Why should people participate in this event? Sue Christensen: I think the “Why” can only be answered by each individual. Most people participate because they have personally been impacted by the disease or some type of dementia. When you have watched a loved one live with the disease and eventually pass away, you understand why it’s so important to raise money and awareness. My “Why” is for our clients. We help families take care of their loved ones while they are living with Alzheimer’s. We know the stress and challenges that come with this disease. The isolation and uncertainty of day to day life is real. I walk to support them! I walk to bring awareness and hopefully a cure someday soon. Why is this event important for Central Minnesota? What’s the impact? Katrice Sisson: St Cloud is fortunate to be one of the host sites for the Walk to End Alzheimer’s. In fact, there are only three walks in the ¼ western portion of the state (Bemidji, St Cloud, and Willmar). If you think about other community fundraisers, there are some that have one in every county. Yet, Alzheimer’s Disease and other Dementias impact (or will most certainly impact) EVERY single family. The Walk to End Alzheimer’s is crucial for Central Minnesota to take part in for several reasons. It raises awareness and brings individuals, families, businesses, and communities together for the same united cause – to support those impacted, increase education and resources, and to fund critical research. Everyone can do something to make a difference! The Walk to End Alzheimer’s is the easiest way to get involved! What is it like to participate in the event? Sue: Even if you haven’t been touched in some way by Alzheimer’s, being there the day of the walk is a great experience. The opening ceremony is always very touching. There is a lot of excitement before the walk starts as teams gather. They have worked hard to raise money and now they get to celebrate as a team and support those afflicted by the disease. Each year there is an honorary family, a local family that has been impacted by Alzheimer’s. They share their story with the walkers prior to the walk and there is usually not a dry eye in the crowd. Sometimes there loved one is walking with them. For other families, they walk in honor of their loved one. It’s uplifting, it’s sobering, and it’s energizing all at the same time. You somehow know you are making a difference!! Do you have any words of inspiration for people who are on the fence about participating? Sue: If someone is on the fence, I would suggest starting with just one small step. Volunteer the day of the event. Just start by doing 1 thing. That’s what I did. I agreed to a volunteer assignment the day of the event and each year I have gotten more and more involved. If you’re not sure, just start with something small…say, yes, to helping in some way. We would love to have you join us!! Katrice: There are so many ways that someone can help volunteer. A few examples are as follows: Welcoming participants and getting them registered/checked in. We need help putting signs up. Someone could also help with handing out water, flowers, and/or tshirts. We can also always use some enthusiastic people to help cheer the walkers on. There is something for every ability to help with! What if I can’t make it to the walk on September 23rd, but I still want to help? Sue: You can help by donating of course. There are walks in other cities near us that might work for you. There are volunteer needs prior to the event. It takes many hands to put together an event like this, so volunteers are always welcome. You can find more information about the day on the event page here. We look forward to seeing you on September 23rd!